Come and join this months F#unctional Londoners meetup to get an introduction to Markov Chains in F#! Come join us this April to learn Elm and work on projects! Beginners welcome! We are very excited to say we are pairing up with #PowerApps & #Flow user group. 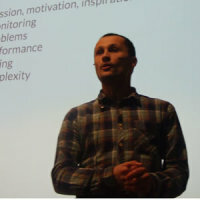 In this session we will have a few showcases of PowerApps work from attendees, then a PowerApps session by Rory followed by a panel where you could ask questions related PowerApps, Power BI and Flow. Come along to learn how to find core domains with the Business Model Canvas with Domain Driven Design London! Don't miss out! In this meetup we have a talk on Why and How to Integrate Python and Excel by Tony Roberts from pyxll.com. Ever wanted to know what its like choosing a career in data? Come along to this months Inspiring Women in Data Science for an insight with Marta Fajlhauer! In this session we’ll discuss the paper ‘Hierarchical Neural Story Generation’ which uses Transformer-based neural networks to generate writing prompts and stories, trained on posts from reddit.com/r/writingprompts. Come along to discuss all the latest PWA news including PWA in Firefox and more! Don't miss out! Fiona Austin will talk at London Tech Ladies May meetup on the topic of Technology Addiction.